Forecasters have issued a snow-ice warning for five counties which will begin tonight. The warning comes just hours after a separate snow-ice warning ended at noon today. The status yellow warning covers Wicklow, Donegal, Leitrim, Mayo and Sligo and is in place from 10pm on Tuesday until 11am on Wednesday morning. 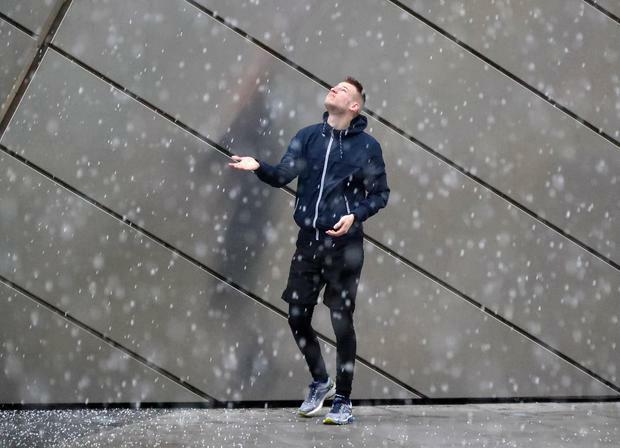 The latest weather warning warns people to expect wintry showers "leading to possible snow accumulations and icy conditions". Status Yellow Snow - Ice warning issued for Wicklow, Donegal, Leitrim, Mayo and Sligo. With temperatures plummeting to lows of -1C, the forecaster has advised people to brace themselves for a return of frost and snow. Met Éireann said the dramatic dip in temperatures was due to a polar air mass moving over Ireland from the north. It will heavily influence our weather for the coming days. The rest of the country is to expect cold and blustery weather for the remainder of today. There is also an ongoing risk of hail and thunder. Temperatures will vary between 5 and 8°C, but may feel colder in the wind. Laura Lynott Ireland basked in temperatures warmer than Barcelona - but people have been urged to get out and enjoy it while they can.